Mobile commerce is growing at 42% per year. Despite this tremendous growth, many businesses still structure their mobile content as though phones were PCs. It’s understandable. Desktops and laptops were the main access points for the Internet, so people know how to structure content for them. Mobile is its own animal, with its own norms. Taking advantage of it doesn’t mean replicating what worked on regular computers. It requires adopting a mobile growth mindset. Maybe it’s product, like a video game. Maybe it’s a service, such as window cleaning. Maybe it’s both. Here’s looking at you, software-as-a-service. Whatever you sell, the thing is only part of the equation. You still need an understanding of who wants to buy it. That doesn’t mean you need to identify a specific customer. What you need to understand are the abstract qualities common to all of your ideal buyers. This is your buyer persona. Say you sell an independent, first-person shooter video game. What does the buyer persona look like? That yields an extremely basic persona applicable to any marketing approach. 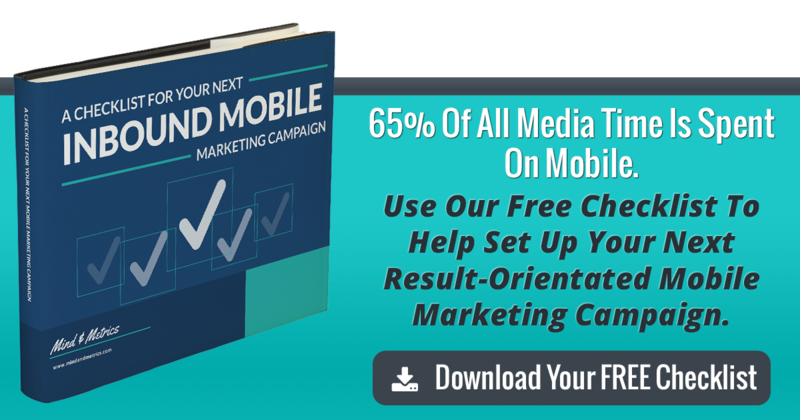 What happens when you throw mobile in the mix? Mobile users bring a host of expectations about speed, responsiveness, and relevance to the table. Your marketing content must be delivered at the right time, in the right format and with minimal waiting involved. For the hypothetical video game buyer in the early stages of decision making that might mean gameplay videos on the product page. For someone on the cusp of buying, it might be a buy now button that ties to their preferred payment option. You can use this guide to help you navigate the process of building a mobile buyer persona. Start with a monthly revenue goal: $6500. Multiply that by the percentage of revenue generated by mobile: 50%. Divide your revenue goal by your average per customer revenue: $500. You’ll need 7 new customers this month. Now that you know how many customers you need, you can figure out how many leads you need. Start with your conversion rate of leads to customers: 3%. To get the total traffic, you need to divide your leads by the conversion rate of visitors to lead. Assume a conversion rate of 2%. People don’t use their phones the same way they use a PC or laptop. Someone might spend 5-10 minutes reading a 1000-word article or watching an 8-minute video on a laptop or desktop system. Mobile users typically engage with content on their phones for 1-2 minutes. That’s about how long it takes to warm up a cup of coffee in a microwave. A mobile growth mindset acknowledges that context when crafting content. Mobile users won’t tolerate a treatise. They’ll move on to something they can digest in a few moments. What’s the average temperature on Venus? Does your product have this feature? Can I buy this now? Their intent is to get the information or take the action and do it more or less immediately. Think of the person who orders a DVD on their phone while you talk about it. For a business or brand, this means mapping content to deliver answers or options within the limits of normal phone behaviors. Sustaining mobile growth means ruthlessly excising friction at every level of the mobile user experience. What is friction? It’s anything that gives the user pause or encourages them to leave your site. Consider landing pages. A landing page should do only one thing: capture leads for the offer on the page. Anything that doesn’t contribute to that end is friction. Another common place where friction occurs is checkout. Filling out registration forms during checkout is annoying with a PC setup. It’s murderous on a phone. Allowing for social logins or guest purchases lets customers sail through checkout with minimal effort. Perhaps the most common friction generator of all is sending potential leads to your home page. Sure, it gives them theoretical access to any part of the site. It also makes them work to find things. If you link from any kind of topic-based content, the link should land customers in a related area of your site. Each of the above probably sounds like a discrete area of concern, which may prove true to some extent. Yet, they all work together to help you develop the mobile growth mindset and achieve your mobile growth goals. Understanding your mobile buyer persona helps you set a realistic revenue goal for mobile marketing. If a tiny percentage of people fit the persona, you can only generate a limited amount of traffic and revenue. If lots of people fit the profile, you can set loftier goals. Your buyer persona also informs your mobile content strategy. Some market segments will respond better to video, some to text, and some would rather listen to audio. Staying conscious of the context and intent of mobile users lets you avoid oversharing. Mobile customers want fast, relevant and responsive content that answers specific questions. If your content doesn’t do that, you’ve lost every mobile customer. The massive, continued growth of m-commerce means brands need to adapt to the unique norms of the mobile platform. If you’ve struggled with this or just want to refine your strategy, contact us today.